The Cluster Buster is a 12 volt high current device used to light multiple igniters. To see a better photo click here. Bench testing has shown that as few as one and as many as eight of our standard igniters , Twiggy, Slim Gem, Fat Boy or Super Fat Boy’s can be lit simultaneously when it is used as directed. Please note that I stopped testing at eight, the possibility exists that more can be done. I tested the Cluster Buster using first two, then four, six and finally eight igniters. Results of this test were captured on video and can be viewed here. Please note that the video file is about 9.5 Meg in length. If the site will not play it properly please right click on this link and select “save target as”. This will down load the video file to your hard drive. A small black box that connects to an auxiliary 12 volt battery. This auxiliary battery is what is used to actually light the igniters. Be sure to use a car type battery. The one I use came from Wal-Mart. It is an Everstart and will provide 540 amps or 450 cold cranking amps (whatever that means?). Bottom line here is you need to make sure you have enough current to do the job. I’d guess that most any car type battery would be fine. Power is like Tupperware, you can’t have too much of it. There are two other sets of leads. One set connects up to a standard 12 volt club type launch control. This is the trigger and is used to activate the Cluster Busters firing current. The idea is to set the Cluster Buster and the auxiliary battery up at the pad you will be using. Hook the unit up as required. The trigger circuit is activated by the LCO just as it were a normal launch. The only difference is that the clubs leads are attached to the trigger circuit rather than the rockets igniters. The LCO will do the count down as normal. When he hits zero and presses his launch button the Cluster Buster springs into action. This closes a relay that connects the auxiliary battery circuit to the cluster of igniters. Very simple. The third set of leads are the igniter leads, these of course attach to the igniters. Each set of leads is properly labeled for ease of use. You will also see a “Continuity Check” button and green LED located on top of the box. 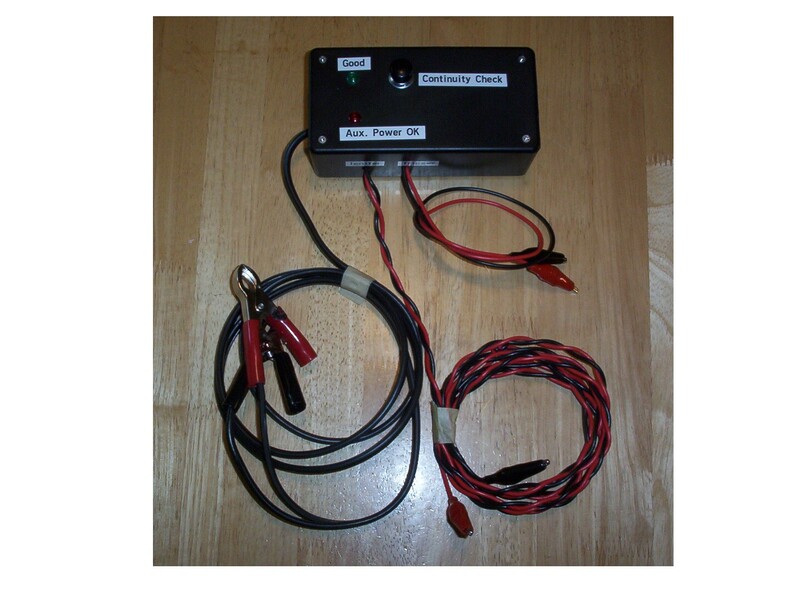 This can be used to test continuity of the igniter(s). Please note that the proper procedure is to test each igniter individually. Testing the entire bundle will show continuity even if only one igniter is good. Take the time and test each one, this will give your clustered project the best opportunity for success. Please see the Cluster Buster Operating procedure here. We suggest that you ground test your igniters with the Cluster buster before betting your bird. Ground testing is always the safest and best bet. The Cluster buster was designed to fire the standard line QuickBurst igniters.